Bodhi Ray (left) leads a chant on the courthouse steps. Photo by Lluvia Moreno. This child’s words were an expression of solidarity with the 21 youth plaintiffs involved in the Juliana v. United States Supreme court case. 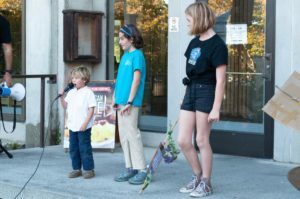 Bodhi was just one of several children who participated in the climate suit march and rally hosted by the Santa Cruz Climate Action Network on Oct. 29. Ranging in age from 11 to 22, the plaintiffs are represented by Our Children’s Trust, an organization that seeks to advocate for youth on the topic of climate health. One of the plaintiffs, whose late father was part of the Santa Cruz community, recorded a personal message specifically for the Santa Cruz ralliers. Several ralliers remarked on the dedication of the involved youth. Adults challenged this perception of complacency as people of all ages gathered in similar rallies across the country. According to 350.org, an international organization that addresses climate change, over 70 demonstrations were staged across 40 states on Oct. 29, the day the trial was supposed to begin. The landmark climate lawsuit has been delayed by the courts for the second time in the last three months at the request of the Trump administration. Though the government’s initial motion to dismiss the lawsuit was denied in July by now-retired Justice Anthony M. Kennedy, this second request may have a different outcome. Newly appointed Justice Brett Kavanaugh believes the executive branch should not be responsible for environmental policy. Frustration with the Trump administration for requesting case delays heightened existing anger at the federal government for failing to implement a climate change prevention plan sooner. Some ralliers instead chose to focus on the potential that the plaintiffs have to change national climate policy. Previous rulings in favor of the plaintiffs are significant because the government effectively recognized in legal documents climate change is real and human-caused. In the face of an administration riddled with climate skeptics, Rodino believes this victory alone is worthy of celebration.